Content marketing hangs its hat on one major concept: You pay less for more. Take a conversion landing page, for example. A well-designed landing page can rank among the big shots for years on end. We’re talking about a one-time investment that drives qualified traffic and conversions, possibly forever. Sounds like a smart investment, right? But what happens when your Domain Authority is dragging and you can’t keep pace with the big dogs? That’s exactly what happened to one of our newer clients in the facility maintenance space before they came to Brafton. As a provider of asset management solutions, they were relying heavily on PPC to own branded terms and relevant keywords. After years following this strategy, their cost-per-lead became unsustainable. Remember, PPC bids are not static, so the premiums on continuous bidding tend to rise, especially on super-competitive terms. Lowering the inbound cost per lead. Ranking for unbranded search terms. Driving more unpaid conversions than paid. To achieve these goals, our strategists put together a plan to deliver blogs, white papers, infographics and LinkedIn management services. We left no stage of the funnel unattended. After only five months into the partnership, we saw extraordinary ROI. A 63.3% lower cost per lead ($125 to $45.8). A 29.5% increase in overall non-paid leads. A balance of 59% non-paid versus 41% paid leads. We were even shocked to find one blog article driving 8 macro conversions worth a total value of $2,800. Further, we saw a direct relationship between the days in which blogs were published and inbound phone calls requesting services. This adjunct goal was a nice cherry on top. There’s no need to bash PPC, but if it’s the primary weapon at your disposal, you need to diversify. 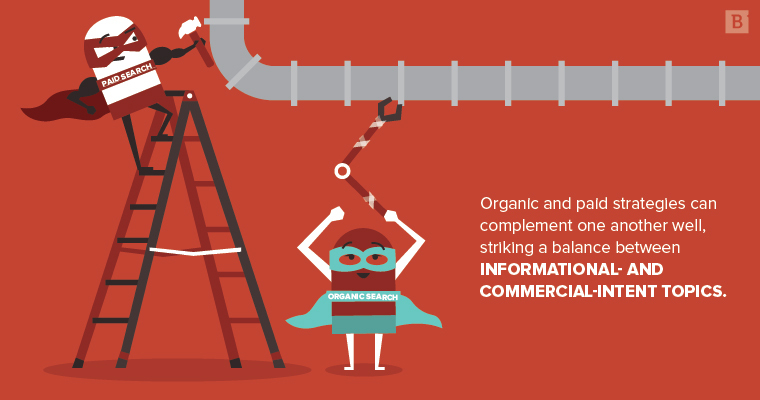 As a matter of fact, organic and paid strategies can complement one another well, striking a balance between informational- and commercial-intent keywords. But what happens if, starting out, you have no organic reach and you have numbers to hit at the end of the month? Are you going to invest heavily in content marketing to hit those numbers? Certainly not. Organic is a long game, and you are playing for the short game. After all, you gotta put food on the table next month. But now you have set a precedent. You need to double down on your PPC spend in order to continue driving leads at the rate you are accustomed to. That means more money out the door. That means higher leveraging. Before long, you have a full-blown problem. Your organic rankings and Domain Authority have stagnated from lack of investment, and you are paying dearly for higher bidding costs. Before you know it, you have your first month in the red. Your hot streak at the table has ended and you have no answers. What do you do? It’s really not. Relying on PPC to keep you afloat is a fool’s gamble. It’s simply a matter of patting yourself on the back for immediate gains. Done in moderation one can realize incredible results. Done improperly, one can find him or herself in the poor house. Our client is still utilizing PPC, but they are now realizing the long-term impact of strong content marketing and, eventually, a cost-effective equilibrium of unpaid and paid conversions. This new strategy will undoubtedly increase their Domain Authority, inbound links, unbranded search terms and, most importantly, unpaid inbound leads. How leveraged is your strategy?